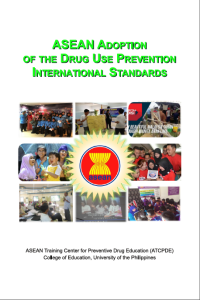 ATCPDE publishes book "ASEAN Adoption of the Drug Use Prevention International Standards"
The ASEAN Training Center for Preventive Drug Education (ATCPDE) recently released a book entitled "ASEAN Adoption of the Drug Use Prevention International Standards." The book features lectures and presentations of ASEAN and local experts during the ASEAN Conference on Drug Use Prevention International Standards last December 5-7, 2016 at the National Institute for Science and Mathematics Education Development (NISMED), University of the Philippines campus in Diliman, Quezon City. ATCPDE Director Prof. Francis Grace H. Duka-Pante, the publication's editor-in-chief assisted by the editorial board (Rosanelia T. Yangco, Maria Cecilia V. Zamora, Virgilio M. Gaje, and Francianne C. Autor), said the conference book summarizes the currently available scientific evidence on interventions and policies found to result in positive prevention outcomes and their characteristics. She added that global standards identify the major components and features of an effective national drug prevention system.